Who doesn't have some leftover bananas from time to time? I'm always looking for interesting new uses for them. These banana bars are a great option. I adapted the recipe from one I found at Betty Crocker. The base is extremely similar to my favorite banana bread. I didn't want to make my banana bread, though, so I added in some butterscotch. That, along with the cinnamon and the frosting makes this a special and quite different treat. The bars smelled delectable as they cooked. And, when they were all finished, I was surprised at the smell and flavor. 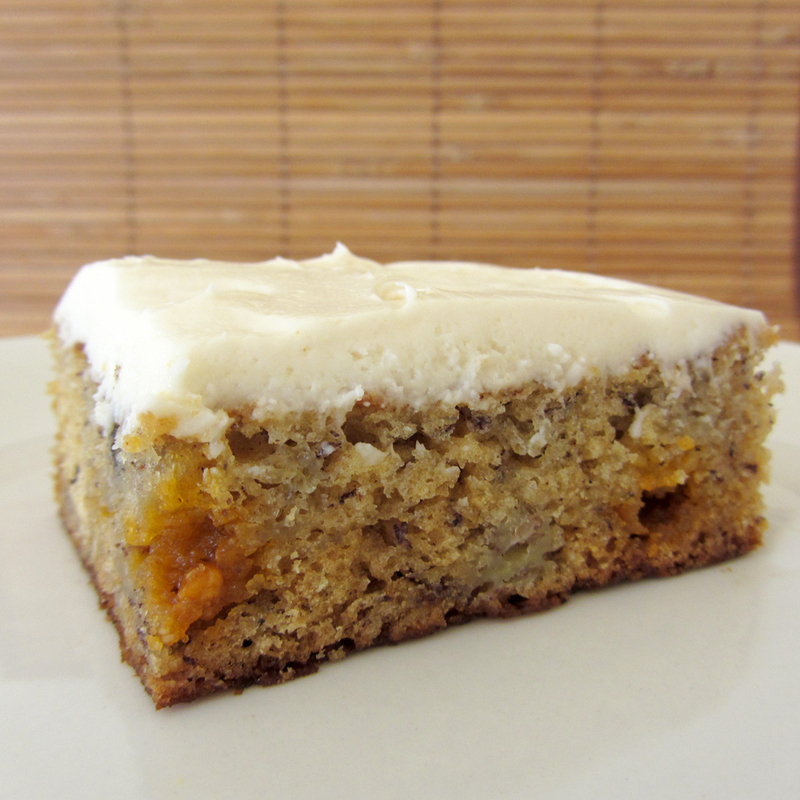 They are quite like a cross between banana bread and carrot cake. Really, really delicious! So, next time you have some ripe bananas hanging around, give these a try. You won't be sorry! 1. For the Bars: Preheat the oven to 350°. Line a 9" X 13" baking dish with parchment paper. Spray the sides of the dish with oil. 2. In a medium bowl, stir together the flour, baking powder, baking soda, cinnamon, and salt. Set aside. 3. In a large bowl whisk the eggs together with the sugar. Whisk in the melted butter. Stir in the mashed banana until thoroughly mixed. 4. Stir the dry ingredients into the wet, just until incorporated. Do not over-mix. 5. Pour the batter into the prepared baking dish. Spread into an even layer. Sprinkle the butterscotch chips evenly over the top. 6. Bake for 25-30 minutes or until a toothpick inserted into the center comes out clean (or with only a few crumbs attached). You may need to test more than once as stabbing a butterscotch chip will skew the results. 7. Transfer the baking dish to a rack to cool completely. 8. For the Frosting: in a medium bowl, beat the cream cheese until smooth. Add the butter and beat until smooth again. Beat in the vanilla extract. 9. Add the powdered sugar to the bowl. Beat on low until the sugar is incorporated. Beat on medium-high until the frosting is smooth. 10. Spread the frosting evenly onto the cooled bars. Place in the freezer for about 10 minutes to firm up the frosting. 11. Cut into bars and serve! To store: cover and chill.